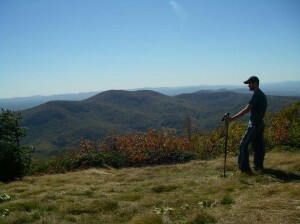 This weekend: Warm up to a hike - GetGoing NC! The best time to hike in a swamp? Right about now, when the temperatures are keeping all the creepy, crawly, bitey critters at bay. And the best way to hike a swamp? Elevated, on a boardwalk. Which is what they’ll be doing Saturday morning at Goose Creek State Park. The Palmetto Boardwalk isn’t long, but it exposes you to a world that otherwise would be difficult to access. 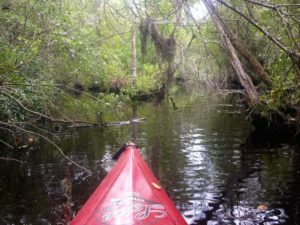 Pennywort and ferns, Dwarf Palmetto, Spanish moss hanging tinsel-like from the canopy, bald cypress, black willows and live oaks, all the flora you associate with swamps — and on a hike with a ranger who will help you make sense of this evocative ecotone. Logistics: Saturday, Jan. 10, 10 a.m., Goose Creek State Park, Washington. More info here: 252.923.2191, more information on Goose Creek State Park, here. Saturday forecast: Sunny with an afternoon high of 38.
Who doesn’t love to discover a new trail? Even better: a new trail that’s actually new. Saturday and Sunday, our GetHiking! program will explore 6.2 miles of new trail in the Uwharrie National Forest, a northern extension of the Uwharrie National Recreation Trail, from the Jumping-Off Rock trailhead off Flint Hill Road to Pisgah Covered Bridge Road. 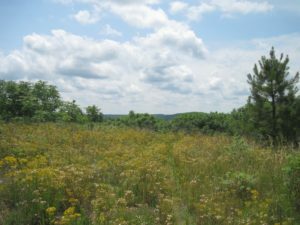 It’s an especially intriguing stretch, topping both Little Long Mountain, which offers one of the few vistas in the Uwharries, and King Mountain, one of the highest points in the range. One more reason to do this hike: it will be lead by Don Childrey, author of the “Uwharrie Lakes Region Trail Guide,” the second edition of which was just released. Don knows the natural and human history of the region better than just about anyone. Logistics: GetHiking! Triangle will do this hike Sunday at 10 a.m. GetHiking! Charlotte and GetHiking! Triad will do the hike Saturday at 10 a.m. For specifics, click on the GetHiking! chapter nearest you. Weekend forecast: Saturday, sunny with a high of 36, Sunday, cloudy with a high of 44. Like Saturday’s YMCA-Woodfin hike at Bear Wallow Mountain. It’s a three-mile round trip with just a 500-foot overall elevation gain. You needn’t be a Y member, there’s even a carpool from the Y, at 40 N. Merrimon Ave. The hike is free, $5 for the carpool would be appreciated. Bear Wallow Mountain: Jan. 10, 8:45 a.m.-3 p.m., YMCA-Woodfin, 40 N. Merrimon Ave., Asheville. Three mile round trip. 500 foot elevation gain. Easy. No need to be a Y member. Bring lunch and water. Dress accordingly. Free. $5 if carpooling. Registration required. Contact Blanca Miller at Bmoi735@gmail.com. Logistics: Saturday, Jan. 10, 8:45 a.m.-3 p.m., Bear Wallow Mountain. Free, but pre-registration is required, by emailing Blanca Miller at Bmoi735@gmail.com. Sunday forecast: Sunny, high of 36.